This week I discovered a new way of drawing nail, using bobby pins. I know most people probably know about using pins for nail art, so did I but I tended to rely on the Barry M or Models Own nail art pens and my dotting tools for anything more intricate. I painted my nails with the Models Own scented polish in Apple Pie. I’m a big fan of the scented range from Models Own because they genuinely do smell of what they’re supposed. They’ve recently launched two new shade, Peach Melba and Coconut, I can’t wait to spot these in the shops. 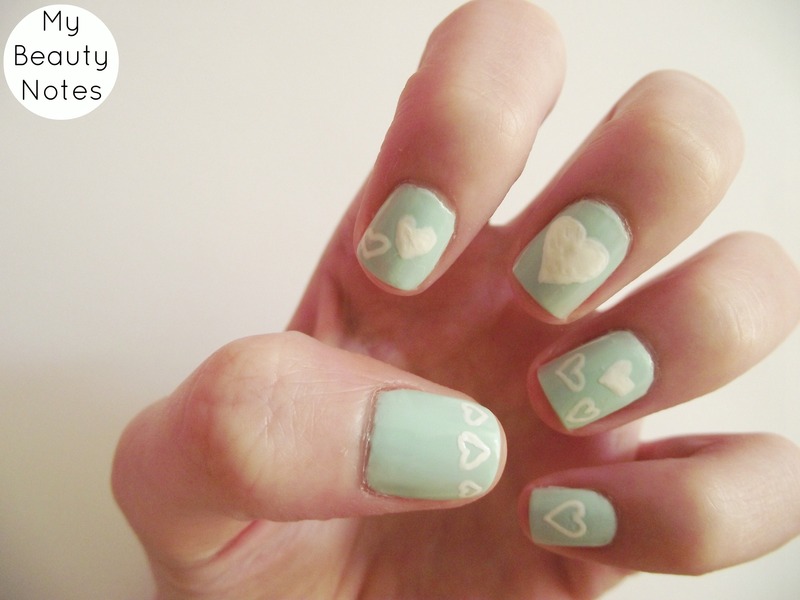 To draw the hearts I used the Models Own polish in Snow White and a bobby pin. I really recommend the white polish from Models Own because it only takes two coats for opaque coverage and its not gloopy and difficult like most white polishes. It did take me a little while and I did make a few mistakes but I think practice makes perfect and being patient. Breakfast In Bed is a pretty mint green shade. In the bottle it looks like there is shimmer but once it’s applied on the nail I really can’t see it, not even under bright sunlight. I know some pastel shades can be difficult to paint because they go on streaky but this didn’t, I painted one thin coat first and then one slightly thicker coat.